Fender Electric XII Model 12 String Solid Body Electric Guitar (1966), made in Fullerton, California, serial # 129528, sunburst lacquer finish, alder body, maple neck with rosewood fingerboard, hard shell case. The "Electric XII" is perhaps not one of Fender's best-remembered creations, but is a superbly engineered, great-sounding, and extremely practical guitar. Introduced at the 1965 NAMM Show at the dawn of the CBS era, the Fender 12-string married the popular Jaguar/Jazzmaster-style body to a new neck with a distinctive extended "hockey stick" headstock. 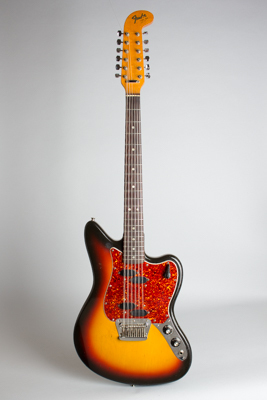 The electronics are unique as well, with two pickups each with two separate coil units, as pioneered by the Precision Bass, and a 4-way selector setup allowing different phase combinations. The bridge is also a marvel of Leo Fender's engineering prowess, with 12 intonation-adjustable saddles, and must be considered the best unit of its kind ever attempted. This one carries pots dated the 17th week of 1966 and a neck dated to April that year, when the great majority of Electric XIIs were made. With all this original engineering, Fender unfortunately missed the boat a bit on the electric 12-string fad, and by the time the "Electric XII" came to market Rickenbacker had already pretty much reaped the bulk of benefit of the Byrds and Beatles' popularization of the sound. For all that, the guitar is a very good design and an excellent-sounding stage or recording instrument, albeit without exactly capturing the Rick's trademark jangle. Led Zeppelin, the Velvet Underground, The Move, The Kinks, Herb Alpert's Tijuana Brass, the Baja Marimba Band, and many others have made classic recordings with this model, and much of its potential is perhaps still untapped. Overall length is 42 7/8 in. (108.9 cm. ), 14 in. (35.6 cm.) wide at lower bout, and 1 1/2 in. (3.8 cm.) in depth, measured at side of rim. Scale length is 25 1/2 in. (648 mm.). Width of nut is 1 11/16 in. (43 mm.). This is a good player's example of the Fender XII -- not the prettiest we have had, but possibly the best playing. There was a LOT of wear to the body edges that has been patched in with black paint; not too conspicuous, but noticeable up close. The face and back have some checking and wear but are comparatively clean. There is one patched spot to the finish on the face just above the upper forward tip of the pickguard. The lacquer on the neck has been rubbed down to the wood from playing along much of the back, resulting in that much-loved "old Fender" feel. The guitar has just been refretted and plays extremely well. All parts and electronics are original; the pickguard is a well-done repro of the correct style tortoise pattern plastic. This is a great gigging example of this now-sought after electric 12-string, one of Leo Fender's better relatively unsung creations. Very Good + Condition.